The D-Day Invasion Museum in Arromanches-les-Bains is one of many fine military museums in Normandy. There is such a treasure trove of fine military museums in Normandy—perhaps more than anywhere else in the world—that we could devote an entire issue to nothing but them. These include the Musée Mémorial d’Omaha Beach (Omaha Beach Memorial Museum) in Saint-Laurent-sur-Mer; La Musée du Débarquement at Utah Beach (La Madeleine); the Musée D-Day Omaha in Vierville; the Airborne Museum in Sainte-Mère-Église; the Musée des Rangers (Rangers Museum) at Pointe du Hoc; the Musée du Débarquement No. 4 Commando (No. 4 Commando Museum) at Sword Beach/Ouistreham and the Musée du Mur de l’Atlantique (Grand Bunker and Atlantic Wall Museum) also at Ouistreham; Centre Juno Beach (Juno Beach Museum) in Courseulles-sur-Mer; Musée Mémorial de la Bataille de Normandie (Battle of Normandy 1944 Memorial Museum) in Bayeux; Musée des épaves sous-marins du Débarquement de Port-en-Bessin (Museum of Undersea Invasion Wrecks) in Port-en-Bessin; Overlord Museum in Colleville-sur-Mer; and the Arromanches 360 (D-Day Circle Vision Cinema) at Arromanches-les-Bains. 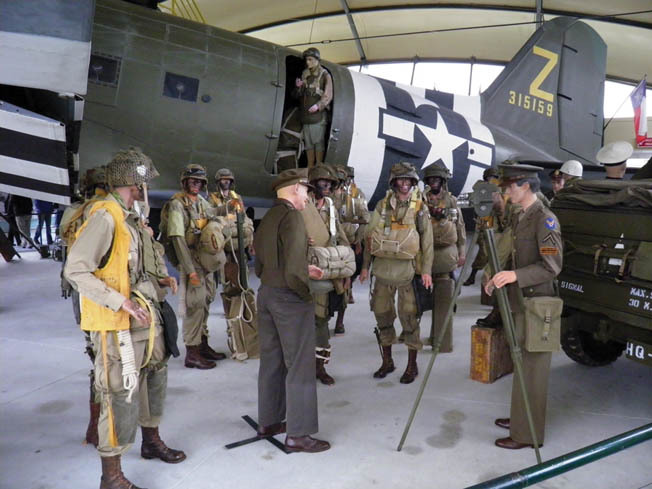 A mannequin of General Eisenhower chatting with 101st Airborne troops outside a C-47 transport plane is one of the highlights of the Airborne Museum at Ste.-Mère-Église. Since we can’t cover them all here we’ve selected one at random: the Musée du Débarquement (D-Day Invasion Museum) that opened in 1954 at Arromanches-les-Bains, on the shore of what was Gold Beach. Here is a wide variety of uniformed mannequins, artifacts (such as an original “Rupert” dummy parachutist that doesn’t look anything like the ones in The Longest Day), a film presentation, a sound-and-light diorama of the landing, and a working model of the artificial “Mulberry B” harbor. 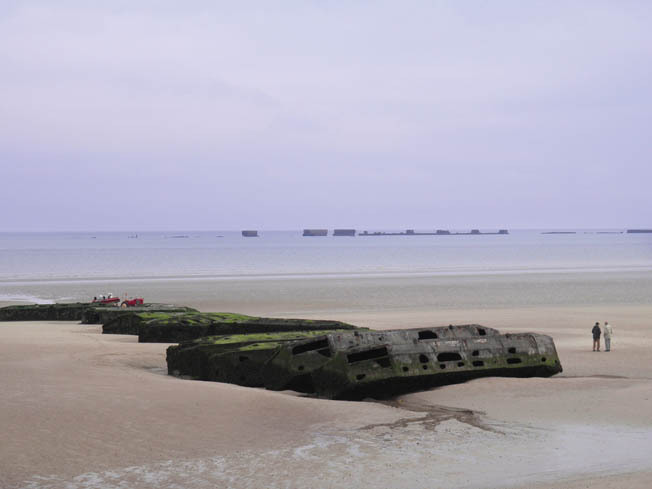 The remains of “Mulberry B” can be visited at low tide at Gold Beach right outside the Musée du Débarquement (D-Day Invasion Museum) at Arromanches-les-Bains. Just outside the museum are the remains of Port Winston, aka “Mulberry B.” When the tide is out, you can walk right out and closely inspect the 20 huge concrete caissons that, for 70 years, have been battered by the sea. 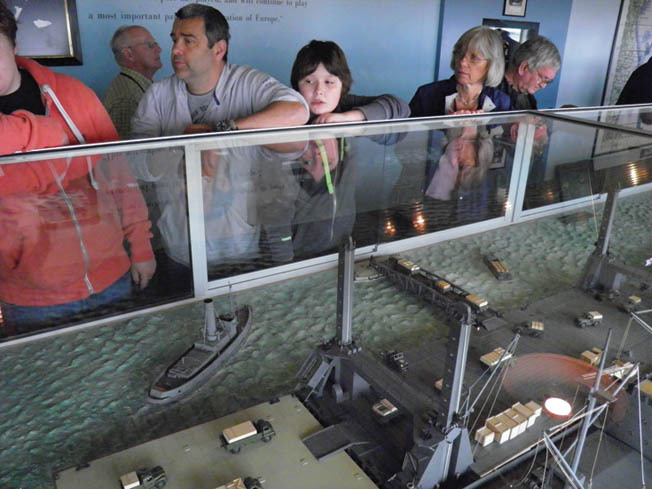 A working scale model of the artificial harbor at the Musée du Débarquement at Arromanches. After an unequaled engineering and construction project, cargo ships began unloading here on June 14—just eight days after the first troops had set foot on the beach. Mulberry B managed to withstand the severe June 19-21 storm that wrecked a similar anchorage (Mulberry A) at Omaha Beach. Tags Allies, Army Rangers, Atlantic Wall, D-Day, France, Gold Beach, Juno Beach, Mulberry harbour, Normandy, Operation Overlord, Pointe Du Hoc, Sword Beach, The Longest Day, Utah Beach.